Preparing food for your baby at home is simple and there are loads of good reasons for doing it. Your Health Visitor will advise you on when to start feeding your baby on solid food - and your baby himself will probably make you aware that he’s hungry for more! Always make sure your hands are clean and that you’re using clean dishes and utensils for the preparation of baby food. Even more than adults, babies are susceptible to tummy bugs. Only introduce one new food at a time. The Four Day Rule – when you’re introducing a new food for the first time, continue feeding your baby that same food for four days to check for any possible allergy. Some allergies don’t show themselves immediately and if you’re introducing a number of new foods, you won’t know which one is responsible. Another good idea is to introduce new foods in the morning so that should they upset your baby, he won’t be keeping you awake all night! Or more importantly, if it turned out to be a serious allergy, you can get help quickly. Traditionally babies have been started on cereal but nowadays pureed vegetables are widely suggested as being more digestible for babies’ tummies. And one of the best to begin with, and often recommended by nutrition experts, is sweet potato. These pink-skinned knobbly vegetables are easily available in greengrocers and supermarkets and have a subtle sweetness that babies love. Preheat the oven to 190oC, gas mark 5. Scrub the sweet potato and prick it all over with a fork. Bake for about 45 minutes, until it feels soft. When it’s cooked, allow to cool a little, then split it open and scoop out the flesh with a teaspoon. Mash it with a fork or puree in a blender. If you bake a few at a time, you can freeze some puree in ice cube trays. If you prefer, you can peel the sweet potato, cut into chunks and boil in unsalted water until tender. Cooked this way the chunks make ideal finger food. Sprinkle with cinnamon and chill for a tasty teething treat. Stored in a cool, airy and dark place, raw sweet potatoes will keep for a week to ten days. But be aware: while your baby’s body uses the beta-carotene in sweet potatoes to make Vitamin A, it’ll only use as much beta-carotene as it needs and any extra will be stored in the skin – which could make your baby look a little orange! This will fade as he begins to eat a more varied diet and isn’t a cause for concern, but if you’re at all worried, consult your doctor or Health Visitor. 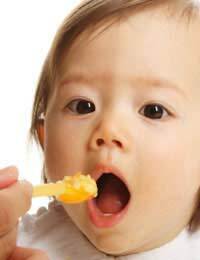 Once your baby is enjoying the sweet potato, you can start introducing other vegetables mixed in with it. Parsnip, potato, swede and carrot can all be boiled until tender and pureed or mashed. Don’t add salt but, as your baby is developing her tastes, sprinkle the vegetables lightly with some fresh or dried herbs before pureeing. It’s advisable to introduce vegetables before fruit as the naturally sweet flavour of fruit may deter your baby from eating vegetables if they come afterwards. Peel and core a sweet dessert apple such as Pink Lady or yellow Golden Delicious. Slice it thinly and place in a small saucepan with a tablespoon of water. Simmer until soft. Mash with a fork or puree in a blender. Make it in larger quantities and freeze in ice cube trays for easy defrosting. Vary the taste by flavouring with a little nutmeg or cinnamon. You can puree a ripe pear in the same way but, because they tend to be a bit watery when stewed, it’s best to mix them with another fruit or vegetable rather than serve alone. Peel and mash ripe bananas or avocado pears (and read Avocado Baby by John Burningham!). Avocado is particularly nutritious. Try mixing banana or peach puree with some natural yogurt. Remember: your baby is unique and he will have his own likes and dislikes. Experiment. Offer different foods. Help your baby’s tastebuds flourish. Be patient! And enjoy this special time with your baby.